The first H. erectusfossils to be discovered were a skullcap (the top portion of the cranium that does not include the face or the bottom where the foramen magnum is located), a molar, and a femur from Trinil, Java, in 1891. These finds comprise the missing link that Eugene Dubois set out from the Netherlands to find. Since then, paleoanthropologists have collected H. erectus specimens from Ethiopia, Kenya, Tanzania, South Africa, Morocco, Italy, India, China ("Peking Man"), and Indonesia ("Java Man" and "Solo Man"). The species marks the first dispersal of hominins outside of Africa that corresponds to a major change in ecology (see the section on "Scavenging and Hunting" in Chapter 5). It is widely assumed that H. erectus evolved in Africa because the ho-minins that preceded it are found there. However, the earliest dates for H. erectus from sites in the Republic of Georgia and Indonesia are pushing 1.8 Mya. 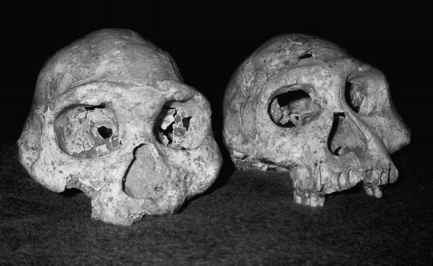 In order for the African origin of the species to be overturned, older fossils of H. habilis or australopiths would need to be found outside of Africa and, as of now, they have not. H. erectus spans nearly 2 million years of hominin evolution, with the last bastion of the species holding on until about 30,000 years in Indonesia. H. erectus is distinguished from preceding hominins by several characteristics. The cranial capacity is increased with a range from about 750 cc to 1200 cc, which extends to within the range of modern human brain sizes (Figure 3.7). H. erectus skulls display no chins, receding foreheads, and massive, short projecting faces surmounted by well-developed browridges (which actually look more like a single horizontal visor compared to later ho-minin browridges which are smaller and sometimes 'm' shaped). They also had smaller teeth and thicker cranial bones than their predecessors. With the arrival of H. erectus comes the first appearance of humanlike body size and proportions. The skeleton was nearly indistinguishable from modern humans, although it was more robust than ours. Males and females were more equal in body and tooth size and shape. The most complete skeleton on record of a H. erectus is the Narioko-tome boy, which is also sometimes called the Turkana boy (KMN-WT 15000) (Figure 3.12). Both names refer to the geographic region where the skeleton was excavated—the site of Nariokotome on the west side of Lake Turkana, Kenya. In 1985, Kamoya Kimeu discovered the boy by spotting a small chunk of the skull that led the excavation team to uncover the entire skull just near the surface and then to the rest of the skeleton deeper in the ground. Figure 3.12 The nearly complete skeleton of a young H. erectus known as the "Nariokotome boy," and also the "Turkana boy," was discovered by Kamoya Kimeu on the west side of Lake Turkana, Kenya, in the early 1980s. Photograph by Alan Walker. The microscopic structure of the Nariokotome boy's teeth indicate he died when he was about eight years old, not eleven or twelve as previously thought. At eight years old, the Nariokotome Boy stood 5 feet 3 inches and would have grown to be over 6 feet tall had he lived to adulthood. The large pitted scar on his mandible from a tooth root abscess could very well indicate the cause of his death. Lesions like that, if left untreated, can lead to infection which can spread to the bloodstream and poison the body through a life-threatening condition called septicemia. The skeleton of the Nariokotome boy shows adaptations for fully committed and efficient bipedalism with no lingering arboreal traits. His limb proportions indicate that Allen's rule (see Chapter 5) was at work on humans way back in the early Pleistocene; his long distal limb segments and narrow pelvis are similar to those of modern people that live in hot tropical climates. The Asian H. erectus skulls share common elements of their appearance. 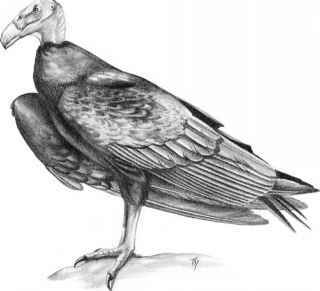 They have even more pronounced browridges, more pronounced keels all over the skull, and thicker cranial bones. This variation causes some researchers to lump all H. erectus from all over the Old World into one species spanning from 1.8 Mya to 30 Kya. But those who emphasize the differences in the Indonesian fossils keep those in H. erectus but call the fossils from Africa and Georgia Homo ergaster, which means "working man." Located in the foothills of the Caucasus Mountains, the village of Dmanisi, Georgia initially interested archaeologists because of its 9th century medieval fortress. In the early 1980s, fossils were discovered in the walls of the storage pits that the medieval inhabitants had dug within the fortress (Figure 3.13). One of the fossils was identified as a H. erectus jaw. Since then at least four skulls and one partial skeleton of H. erectus as well as hundreds of crude stone tools have been unearthed at Dmanisi (Figure 3.14). The fossil-bearing layer at Dmanisi is dated to about 1.78 Mya, tying it with Trinil, Indonesia, for the earliest hominin site outside of Africa. Because of the consistent flow of hominin fossils from the site, Dmanisi is the premier locality for studying the first hominin dispersal out of Africa. 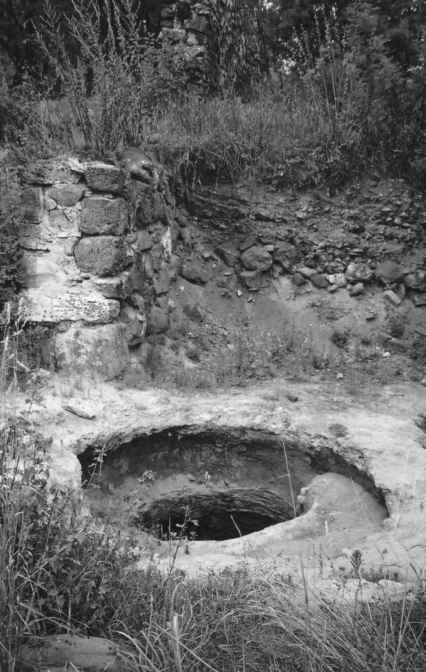 Figure 3.13 Fossil deposits underneath a 9th-century fortress at Dmanisi were discovered while archaeologists explored medieval storage pits like this one. Photograph by Holly Dunsworth. Figure 3.14 Two of the skulls discovered at the early Pleistocene site of Dmanisi, Georgia, are excellently preserved (D 3444 (left) and D 2700 (right) affectionately known as "Poor Marc"). Photograph by Holly Dunsworth with permission from David Lordkipanidze.